Designer of the award-winning, crowdsourced Crossfade M-100, announces its latest inventions, VAMP VERZA and Metallo case. Geared for the modern audio connoisseur, VERZA transforms your smartphone into a mobile hi-fi system. Designed in Italy and made in Japan, it builds off of the original VAMP for iPhone 4/4S featuring an integrated 150mW x 2 headphone amplifier, 2 DAC (Digital-to-Analog Converters) and a 2200mAh battery pack. VAMP VERZA also introduces the patent-pending VERZADOCK that seamlessly integrates with popular smartphone and tablets. VAMP VERZA can be used as a standalone Hi-Fi USB Audio amplifier, or mobile audiophiles can dock it with the machined METALLO case built specifically for the Samsung Galaxy S III. Future cases for the Samsung Galaxy S IV, Note II and iPhone 5 will be available in the upcoming months. Metallo slides and locks onto VERZA’s high-performance audio engine with the VERZADOCK rail mechanism designed for optimal precision and tactility. The case can be used independently with the included back cover for times when portability is more important than function. VAMP VERZA’s audiophile-grade dedicated DACs extracts pure digital output from your computer, Android, or iOS device via USB/micro-USB and converts it into analog form for the purest mobile audio listening experience. VERZA’s 150mW x 2 amplifier delivers enhanced power for higher end headphones and up to 7 hours of playback. Low noise anti-interference is provided by Burr Brown, AKM DAC and a 6-layer PCB, features usually found only in hi-end digital players. These features isolate the components so your audio sounds more like the original recording with less resonance, radio interference and background noise. VAMP’s rotary volume knob allows you to finely control your volume and the hi/lo gain switch adjusts the output level. Additionally, professional musicians can use the VAMP VERZA with their computer or portable device to audition, mix and master projects on the road trusting the sound is consistent from device to device. The 2200 mAh lithium-ion battery can be used as a backup power source for virtually any USB powered device, and can double most smartphone’s battery life. Another unique feature is an optical audio output that allows you to connect VAMP VERZA to your A/V receiver, DJ mixer or aftermarket car stereo via Toslink or SPDIF optical audio, transforming your device into a Hi-Fi grade audio source. The new designer Metallo cases defend your smartphone and are machined and anodized from a single aluminum metal block. Each unit takes nearly an hour to machine the unique V-ANGLE design and finishes. The lightweight Metallo can be used independently of the VAMP VERZA as one of the back plates is designed for ultra-portable use. The second back plate, VERZADOCK, bolts onto the VAMP VERZA’s 4-bolt main so that you can slide and lock the phone onto VAMP VERZA. The precision is unique and even the sound when switching the plates or docking was tuned to emulate unsheathing a sword. When docked to VAMP VERZA, it locks safely into place with a sliding lock mechanism. To use your camera, simply pull the case out and up. Metallo is available for pre-order for the Samsung Galaxy S III and will ship within two weeks. Metallo for iPhone 5 will be available in limited quantities for crowd-sourced beta testing within two weeks. Metallo will also be made for the Samsung Galaxy S IV, Note II and select devices in the near future. VAMP VERZA is priced at $598 and will be globally available in Matte Black, Shadow (Red and Brushed Black Metal) and White with Orange accents at V-MODA.com/VAMP and Amazon as well as the finest specialty stores on the planet, such as Collette in Paris and AC Gears in NYC. Metallo case is priced at $101 and is available for pre-order at V-MODA.com/METALLO and will also be available at Collette and AC Gears. 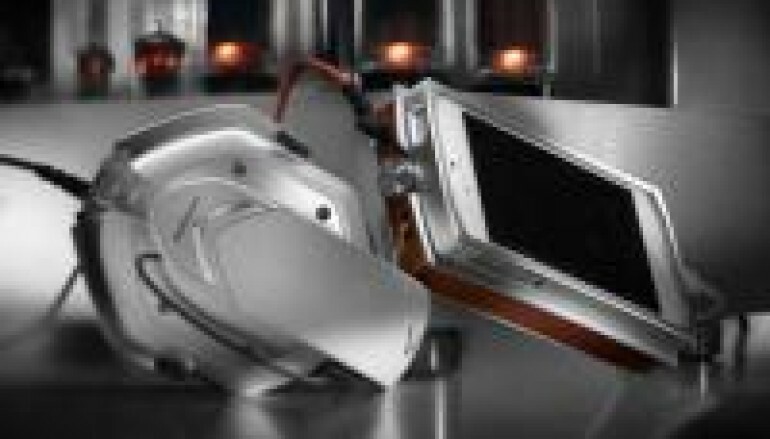 Check out the V-Moda store on Amazon for their complete line of great dj headphones and accessories.